Kids Pay The Price In Fight Over Fixing Philadelphia Schools One of the nation's largest school systems has been pushed to the brink of insolvency. Not long ago, Philadelphia was touted as a "laboratory of innovation," a promising model for urban public education. But something went wrong. So who is responsible for the district's descent into academic and financial ruin? Sharron Snyder and Othella Stanback, both seniors at Philadelphia's Benjamin Franklin High, will be the first in their families to graduate from high school. This, their final year, was supposed to be memorable. Instead, these teenagers say they feel cheated. "We're fed up with the budget cuts and everything. Like, this year, my school is like really overcrowded. We don't even have lockers because it's, like, too many students," Sharron says. Franklin High doubled in size because it absorbed hundreds of kids from two high schools the district could not afford to keep open this fall. But "we didn't gain an extra counselor, we didn't gain extra teachers," Othella says. What's worse, Othella adds, is that without enough guidance counselors, she's not getting much help with her college applications. "I have no one to talk to. ... I'm sitting there, like, having a panic attack in class because I don't know what I'm supposed to do," Othella says. "It's just they're taking so much away from us and expecting us to do so much with so little," Sharron says. Layoffs at the beginning of the school year included teachers, librarians, clerical staff — even school nurses. They're down to one per 1,500 students districtwide. 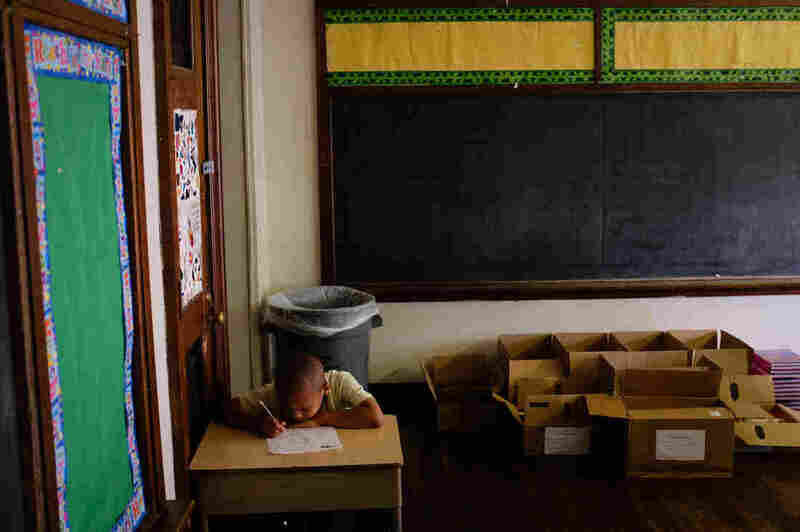 "The crisis is real," says Philadelphia schools Superintendent William Hite. Hite says state budget cuts have left him with a $304 million deficit this year. "In addition to that, we lost $134 million in federal grants. All combined, it was $450 million. So if, in fact, there is not a more significant investment in the education of the children of Philadelphia, the future is at risk." But has there really been a lack of investment in Philadelphia's public schools? Private foundations, after all, have poured millions of dollars into schools here; much of that money has gone to the city's 86 privately run charter schools. But in terms of public funds, the district says it's broke. 1998 — Philadelphia Mayor Ed Rendell and David Hornbeck, school district superintendent, sue Pennsylvania, accusing the state of not adequately funding the city's public schools. The suit goes nowhere. 2001 — Pennsylvania moves to take over the school district, citing a total breakdown in administration as well as scandalously low test scores and graduation rates. Hornbeck and the city's elected school board are ousted. The state creates a five-member School Reform Commission (SRC). 2002-2011 — The SRC oversees a massive expansion of charter schools and takeover of struggling schools by private third-party operators. Dozens of private foundations pour millions of dollars into Philadelphia, mostly to subsidize charter schools. 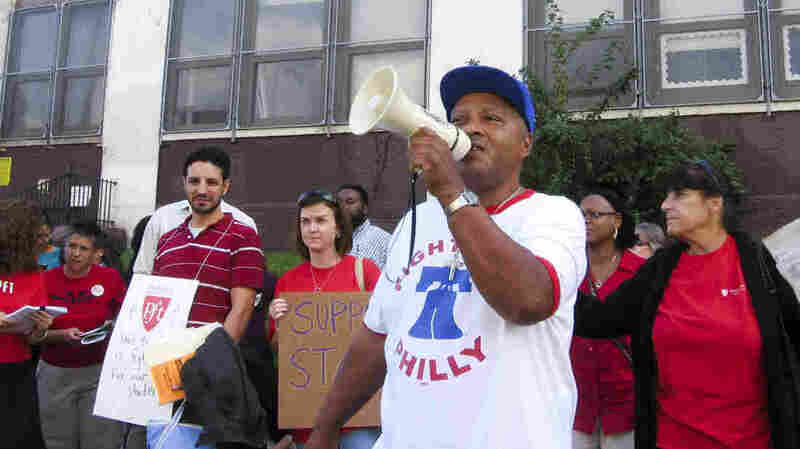 2011 — Philadelphia loses almost $200 million due to federal aid budget cuts. February 2012 — The SRC hires a global business consulting group to help the district devise a cost-cutting plan. The group's $2.7 million fee is paid with private donations, reportedly from powerful pro-charter, pro-voucher advocates. The group wants to expand privately run, publicly funded charter schools, shut down 60 traditional public schools over five years and reorganize all other schools. June 2012 — In the face of a $304 million budget deficit, the SRC eliminates athletics, art, music and most extracurricular activities. Layoff notices go out to 3,800 district employees, including teachers, counselors, administrators, aides and clerical staff. Fall 2013 — Still broke, the district announces it will have to permanently close more than 20 schools. The mayor borrows money to open the remaining schools with bare-bones budgets. Many parents are asked to buy paper, books and basic supplies for schools to operate. October 2013 — The SRC restores music, art and athletics programs and rehires some guidance counselors and support staff after Gov. Tom Corbett releases $45 million he had been withholding pending discussions with Philadelphia's teachers union. Superintendent William Hite warns that without union concessions on pay and health benefits, the district next year will be back to where it was: broke and unable to operate. Is it the state's struggling economy? Poor management and waste? Or, as some critics allege, is it the fault of the politicians who control the district's funding, starting with Republican Gov. Tom Corbett? "Absolutely, he's 100 percent responsible for what's happening in the Philadelphia public schools," says Helen Gym, founder of Parents United for Public Education. A former teacher and a mother of three, she has helped organize protests across Philadelphia. Protesters have targeted Corbett because Philadelphia's public schools have been under the state's control since 2001 — after years of dysfunction under an elected school board and chronically low test scores and graduation rates. Nobody wants to go back to that, Gym says, but lawmakers think they can get better results by sending less money. "Children are languishing in these overcrowded classrooms. They don't have books and supplies. ... Some of them don't even have sufficient numbers of desks," Gym says. "This is a very purposeful defunding, starving of one of the nation's largest school districts, not to mention the academic chaos that is going on in every single classroom across the city." Charles Zogby, Pennsylvania's budget secretary and a close Corbett ally, says that's an outright falsehood. "None of this has been intentional," Zogby says. "In fact, if it was political, then why would a Republican governor deliver $138 million in new funding to Philadelphia public schools? To lay this all on the governor, I think, is just really off base." What people in Philadelphia should be asking, says Zogby, is what have they gotten from the money they're spending? "It's gotten us 50 percent of African-American and Latino kids who can't read and do math," Zogby says. Angry parents and teachers, though, will hear none of it. They say their schools are being starved, plain and simple. David Hornbeck says Philadelphia's schools have been underfunded for decades. He should know: He served as superintendent of schools in Philadelphia from 1994 through 2000. Before he was ousted to make room for a state-appointed School Reform Commission to run schools, Hornbeck sued the state, accusing lawmakers of denying the city's mostly poor, black and Latino children their right to an equal educational opportunity guaranteed by the state constitution. The suit went nowhere. "Putting money in Philadelphia was sending money down the rat hole — and they really did use that kind of language on a routine basis," Hornbeck says. The prevalent view among lawmakers to this day, says Hornbeck, is that the city's schools are not underfunded, that the budget crisis is the result of the waste and inefficiencies of traditional public schools. So the commission's solution has been to hand schools over to private nonprofits and for-profits that came to Philadelphia promising to create a so-called laboratory of innovation, made up mostly of charter schools, for less money. Today, charter schools represent almost a third of the district's $2.4 billion budget. Hite says parents now have more choices, better choices. "This is about saving public education, not destroying it, but we just can't save it by saying we're going to maintain status quo," Hite says. The Philadelphia Federation of Teachers protests outside Feltonville Intermediate School in Philadelphia last month. The protesters demanded the reinstatement of counselors and teachers aides, and blamed Gov. Tom Corbett for budget cuts. What's happening in Philadelphia is alarming, says education historian Diane Ravitch, a leading critic of what she calls the privatization of the school reform movement. She says school districts that are having to cut to the bone, like Philadelphia, are creating dual school systems — one made up of charters backed by private funders and the other, says Ravitch, "will be the dumping grounds for kids who couldn't get into charters." "People continue to push this model," she says, "whether it's the Gates Foundation, the Broad Foundation, the Walton Foundation, the Dell Foundation — I could go on and on with all the foundations pumping millions and millions of dollars into charters." Foundations say that money is giving struggling kids a shot at a better education. In Philadelphia, though, most charters are actually performing the same — and in some cases, worse — than traditional public schools, and yet charter school enrollment has skyrocketed. And that makes some parents nervous. "It looks like they're trying to do away with public schools and make everything charter. That's the way it looks now to me," says parent Donna Mackie. She has an 8-year-old at A.S. Jenks Elementary, a high-performing neighborhood school in South Philadelphia. She says parents' biggest fear is that the district is going to shut down their school in a year or two to save money. School district officials have talked about closing up to 60 in five years. They call it "right sizing" the system. Jennifer Miller, also a Jenks mom, calls it a mistake. "I feel bad, and I feel like I have nowhere to go. I mean, I live here. I can't leave the city. I can't afford private school. This is my only choice," Miller says. Sometimes, Miller says, she can't sleep at night, not knowing whether her school and city will survive this crisis.